What is the difference between a rugged wildebeest man with a beard and a Classic Man with a beard? Classic Man Beard Oil is the answer. This beard oil was developed by a bearded man to give you an amazingly well-balanced beard oil using only top shelf ingredients. 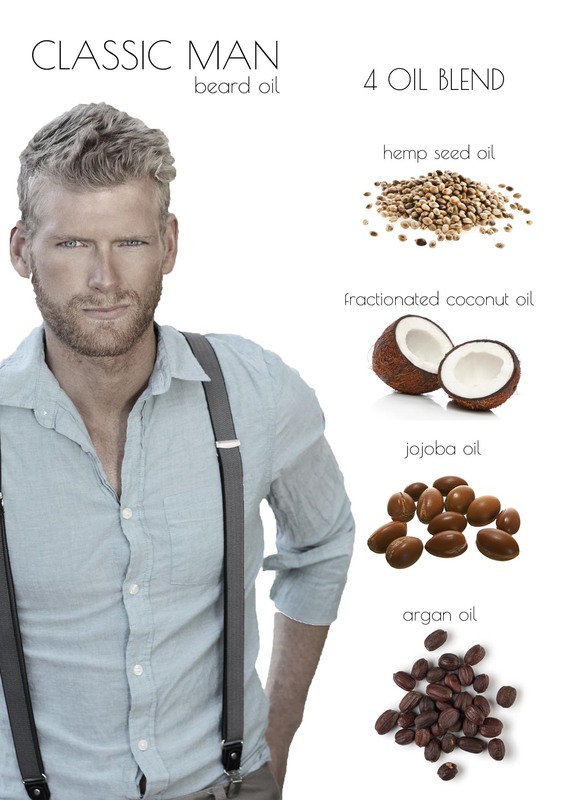 The Classic Man Beard Oil not only conditions your skin and keeps your beard velvety soft with the addition of Argan and hemp seed oil, but smells like a quality cologne. Ingredients: fractionated coconut oil (MCT), golden jojoba oil, hemp seed oil, tea tree essential oil orange bitter essential oil, peppermint essential oil, argan oil, vitamin e oil, all natural fragrance. Ideal for: All year round use for men with light/heavy stubble to a full beard. I've only now used this three days in a row, but the skin under my beard has stopped flaking, and I can already notice my beard softening up. So since its softer and oiled up, it stays where I want it and looks nicer. This stuff is so great, and easy to use. A little goes a long way. Great scent, and leaves my beard feeling nice and soft.